SIX FOOTBALL TEAMS – including Garden Grove High – have plenty to cheer about as they are unbeaten (OC Tribune photo). Good start. Six local teams are undefeated after Week One (and Week Zero) in high school football for the Garden Grove-Huntington Beach-Westminster area. Four are 2-0 as we head into Week Two (which is really Week Three for some schools. 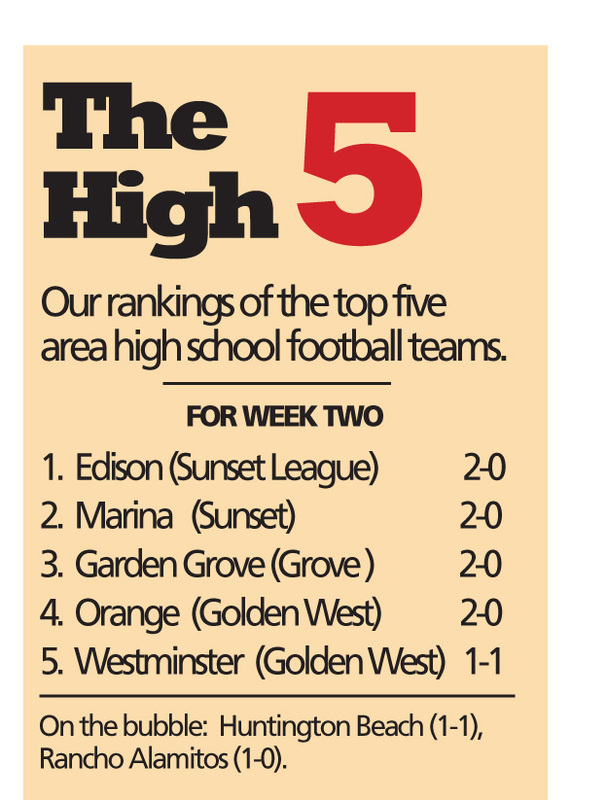 Our High Five rankings for this Monday keep Edison in the number one spot, but jump Marina into the second slot. 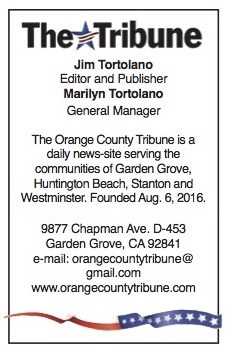 Garden Grove is third, followed by Orange and Westminster. On the bubble are Rancho Alamitos and Huntington Beach. The surprise so far of the young 2016 campaign has been Marina. The Vikings were 1-9 last year, and so have already doubled last year’s win total. At the other end of the “hmmmm …” list is Pacifica, which is 0-2 early in a season in which the Mariners are expected to be strong. 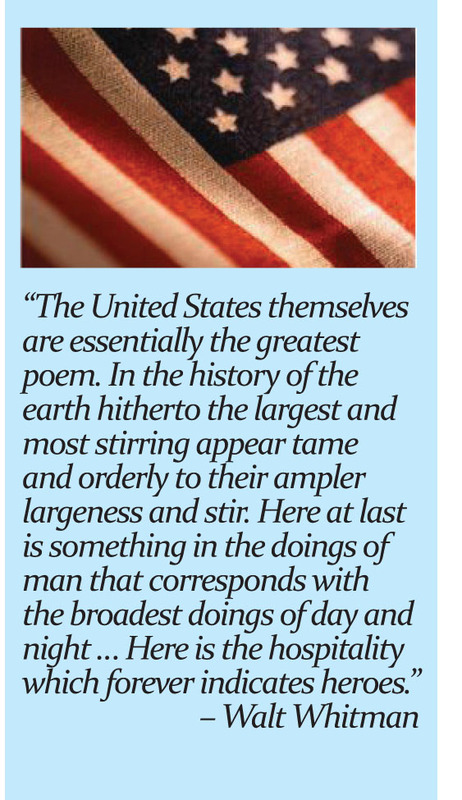 To be fair, though, the blue-black-white have faced two strong opponents. Here’s this week’s prep football schedule. As always, check with the school before packing your Thermos; venues and even dates can change without notice. Orange (2-0) at Santiago (1-1) at Garden Grove High. Edison (2-0) at Canyon (0-2) at Fred Kelly Stadium. The Webb Schools (1-1) at La Quinta (0-1) at Bolsa Grande. On the subject of firsts for area football teams, Golden West College will soon have its first true “home” game after 50 years of playing at LeBard Stadium on the Orange Coast College campus. In observance of the school’s half-century anniversary, the Rustlers will host Palomar College on Oct. 22 at a temporary field on the campus in Huntington Beach. A new synthetic practice surface was installed last year, and temporary bleachers will be brought in for this contest. GWC sports administrators hope this could eventually lead to an a permanent on-campus football facility. Just how smart are Major League Baseball general managers? How good are they at evaluating talent? In the case of the Los Angeles Angels of Anaheim, maybe not that great. The FiveThirtyEight website, which has made its name using statistics to predict the outcome of political races, also weighs in on sports issues as well. Neil Paine recently authored an article in which he analyzed the performances of players who were originally drafted (or otherwise acquired) by a team using the WAR (wins above replacement) stat. The measure indicates how many victories the players brought a team, compared to a typical player. In the case of the Angels – now 60-75 and in fourth in the American League West – would instead be 73-60 if they’d just hung on to players they already had. That’s an improvement of 13 games and a reversal of fortune that would put the Halos just 2.5 games out of first, instead of 20.5 games. The Dodgers, on the other hand, are eight games ahead of where they would have been had they not shuffled their personnel.